What is your favorite song about writing? Here are 14 to choose from. This week, let’s have a little fun and inspiration. While most songs are about mushy stuff, like love and romance, or about painful stuff, like heartbreak and social turmoil, there are some songs about writing or at least paying tribute to writers. Is there a more classic song about writing than Paperback Writer by The Beatles? I think not. We won’t reproduce the whole lyrics for all the songs, but for this one … oh, yeah. Comparing the lyrics between Book of Love and Everyday I Write The Book, one can easily imagine where Elvis Costello might have found his inspiration. Full lyrics for this one, too – last one, I promise. This song compares life and love to a movie script and to a paperback novel. Below are the lyrics for the verse built on the concept of a paperback novel. This is a song to God, totally about writing a story, but not in the conventional sense, of course. Nevertheless, like the songs above, this one carries with writing a story as a metaphor for living life. We go from writing books and lives to writing songs. There are quite a few of this nature, but here is just one. And here is another one. Sorry, I couldn’t resist. If I left this one out, I would be skewered in the comments. Below is the verse that actually mentions the writing process. Some love songs are also songs about writing, especially when it comes to writing love letters. That is, assuming anybody remembers what a love letter is. These days people tend to send misspelled text messages instead. 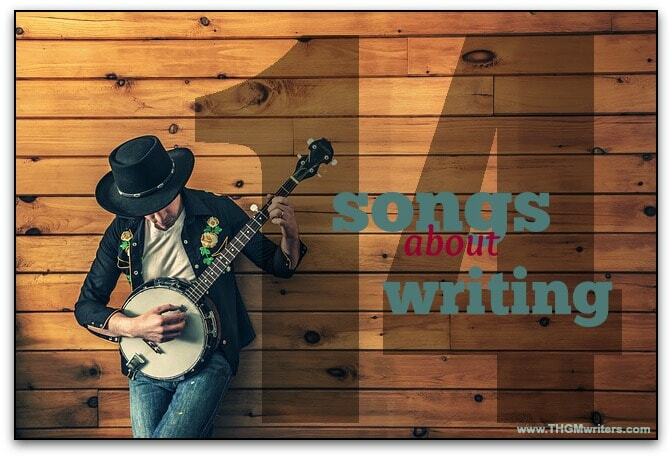 So we get a heartbreak song on our list of writing songs, anyway. This is a great fiddlin’ tune about that sad, sad letter that arrives. Below are the lyrics of the refrain. She might have got that tear stained letter from Johnny Cash, since it appears that he sent one. The lyrics for one of the verses are below. That’s only known to you and me. You turn me off and bring me down. That ever did arrive in your hometown. Your mailman ever did bring around. No tears in this one, just heartache. And divorce. And a new romance, perhaps. But most importantly, another letter to write. Below is the refrain. On a happier note, my baby just wrote me a letter. That is the message in the refrain below. So far, we have written letters and books, on paper and on hearts. Now let’s write on the wall. Below is the final verse of Sounds of Silence. And below is the last verse of another great Simon and Garfunkle hit, where we get to hide in our books and in our poetry. And do they ever look young in this video! This one is not about writing at all. It’s not even about Shakespeare. But it does bear his name, so let’s include it in our list, just for fun. Below are the lyrics from the refrain. Do you like Shakespeare? Jeff Buckely? Do you like kissing when it’s raining? Did I leave out any of your favorites? Feel free to mention them in the comments. I am sure there are dozens I’ve missed. What an amazing post. Some different. This is my first time to reading this kind of post. All the songs are wonderful. Glad to visit this post. Thanks for sharing with us. have a nice day! What a great collection, thanks for doing this.